When the likes of Denver and Johns Hopkins can hang with North Carolina and Maryland. Lacrosse… Lacrosse… is that the one that’s supposed to be the ice cream of the future? No, you’re thinking of Dippin’ Dots, but I can understand the confusion. There was a time in the 2000s when people were falling all over themselves to dub lacrosse the sport of America’s future. And yes, you’re way more likely to see little kids with lacrosse sticks in Anytown, U.S.A. these days, but it’s become abundantly clear that the sport still has a waaaaaays to go before it has any kind of foothold in the American pop culture. Maybe they should start a pro league. What? They did! There’s two! How do you not… you know what, let’s just stick to college. Okay, so what’s happening this weekend? Is this one of those college tournaments where everyone gets all excited about potential upsets and throws all these different possible winners out there but then a team from North Carolina wins it because that’s how college sports work? You know what, let’s not dwell on the past. Okay, so this weekend begins* the NCAA Tournament, in which 16 of America’s best lacrosse teams battle it out to determine who will be 2017 NCAA Champion (here’s the full bracket). This weekend, we’ll see the opening round of play before we get whittled down to eight teams. Next weekend, we’ll find out who the Final Four will be. And then the Final Four itself will be played on May 27 with the National Championship game on Memorial Day as Jesus intended. *Technically, it began Thursday when Bryant beat Monmouth in the play-in game. So who are the big names? Who are the top seeds? Well, Maryland, obviously. The Terrapins come into the tournament as the No. 1 seed thanks to a 12-3 record, Big Ten title, and perhaps a little help from a late-season Syracuse loss. As you might have noticed above, the Terps have gone to two consecutive title games and come home empty-handed both times. In fact, they’ve done that four times since 2011, so they’ve developed a bit of a reputation. They haven’t won a title since 1973, which is basically an Ice Age to powerhouse lacrosse programs. So while they look good on paper, they also have an enormous monkey on their back. Also, they have a guy named Matt Rambo who is really good. His name is Rambo, what did people expect? Syracuse (12-2) is your No. 2 seed. The Orange are one of the sport’s most storied programs (11 National Titles if you ask them, 10 National Titles if you ask the NCAA). There was a time when SU qualifying for the Final Four was a given. Literally. 22 straight years. Those days are over, but the Orange are still usually to be found somewhere in the top 10. This year, they’re the Cardiac Cuse, seemingly winning or losing every game this season by one goal in the final moments. It’s the kind of reputation that either takes you far or trips you up way too soon. What will some Syracuse fans say if they don’t win the National Title? What will some Syracuse fans say if they do win the National Title? Ohio State is your No. 3 seed and if you were a longtime lacrosse fan who went into a coma in, say, 2005, and just woke up, you’re probably losing your mind right now. THE Ohio State? Good at lacrosse??? Pretty good indeed, and the sport is thankful for it as it needs big-time schools like OSU to support the sport if it’s going to latch on in places outside of Long Island. The Buckeyes had a solid regular season (13-4) but they were done no favors, drawing streaky Loyola in the first round. If they make it to the second round, another quality program awaits. Rounding out the top four seeds is Notre Dame. The Irish boast a mediocre 8-5 record but they did so against the nation’s toughest schedule. Wins over Maryland, Ohio State, and North Carolina offset many of those losses in the eyes of the committee. The Irish have also not-so-quietly become one of the powers of the sport, earning four Final Four berths since 2010.
Who else do I need to know? Seriously! Denver has become one of the top programs in the sport, thanks to the shocking arrival of head coach Bill Tierney who won six NCAA Titles with Princeton. All he’s done since coming here in 2010 is take the Pioneers to four Final Fours and win the 2015 National Title. They’re back again at the No. 5 seed this year. You’re just gonna have to accept it. Okay, where’s John Hopkins? They’re always good, right? Johns Hopkins with an S.
Is that like Attorneys General? Just… yeah sure. Like death and taxes, Hopkins is in the NCAA Tournament mix as the No. 6 seed. They’re going through a bit of a down cycle their own standards with only one Final Four to speak of this decade (2015). They also come into this tournament with an 8-6 record (Not great, Bob) and a first-round draw against Duke (12-4), so this might not be their year either. Wait, where’s Princeton? Aren’t they supposed to be the best lacrosse program? Well, you’re right that, for a time, they were probably the best lacrosse program around. Between 1992 and 2002, they played for the NCAA Title eight times and won six of those championships. But then Bill Tierney shuffled off from there after 2009 and the program has basically faded into Bolivian since then, making the NCAA Tournament twice and not since 2012. They’ve been usurped in the Ivy League standings by schools such as Cornell (three Final Fours since 2009), Brown (2016 Final Four), and Yale. The Bulldogs are in the tourney this year, taking on Syracuse in the first round. I remember seeing something on Twitter a couple months ago about Rutgers being No. 1. Where are they? Oh, Rutgers. Bless their hearts. The Pride of the Big Ten did indeed race out to an 8-0 season start, defeating a murderer’s row that included St. John’s, Fairfield, Wagner, and NJIT. They were awarded with the No. 1 spot in the Media Poll and then they promptly Rutgers’d all over their success. They lost four of their last six games and, coupled with their atrocious SOS, went from No. 1 to not even in the tournament. How much more Rutgers can you get? None. None more Rutgers. What about the unseeded teams? Will one of them take down these fat cat programs? It’s possible, but unlikely. True, last year’s champion was unseeded but last year’s champion was also North Carolina, which has a pretty solid historical resume as well. It’s true that the sport has gotten a much-needed shot in the arm in terms of new blood in the last decade. Even just having schools like Duke, Loyola, Notre Dame, and Denver ascend to the top tier of the sport was a break from the normalcy of seeing the same three or four schools play for the title every year. But college lacrosse is still a good old boy network. Even if some familiar faces such as Princeton and Virginia have fallen off, there’s still always enough Syracuse, Maryland, and Hopkins to go around. If you were going to keep an eye on some unseeded upstarts to make a run, you might want to consider Duke, who feels like a trendy upset pick, especially given their placement against a vulnerable Hopkins and a potential showdown with Ohio State, who lost to Rutgers in their final game of the regular season. Also keep an eye on Loyola, Ohio State’s first round opponent. The 2012 champs come into this tournament with a sneaky-good resume and the talent to make a run. No. 8 seed Albany, naturally. At least, that’s what the simulations tell College Crosse’s Matt Glaude. He sim’d the tourney 20,000 times and found that the 14-2 Great Danes are criminally under-seeded this time around. So much so that their potential second-round matchup with No. 1 Maryland probably could have been the National Championship game in another universe. If attackman Connor Fields decides to take over, it’s going to be a long day for whoever steps on the field against then. 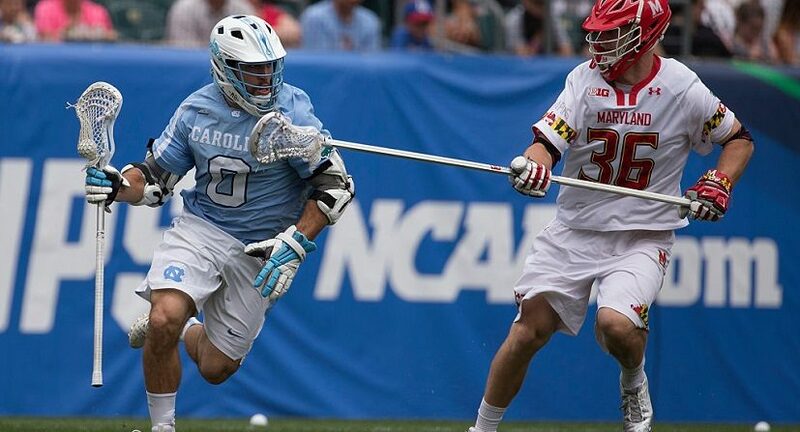 The Tewaaraton Trophy finalist leads the NCAA in points per game (6.75) with 51 goals and 57 assists. Dude puts up so many points that no one else in the nation is within 25 of him. It’s their version of the Heisman Trophy, named in honor of the Mohawk word for the game that ultimately became what we know today as lacrosse. Oh yeah, lacrosse comes from Native Americans. That’s not weird that nowadays it’s a sport known for being played predominantly by white people from privileged backgrounds, right? Find out how you can watch the 2017 NCAA Tournament right here.